The publisher Tousuisha and its magazine Ichiraci have made major issues lately: they’ve recently cut back to an every two-month publishing schedule, they lost Abe Miyuki, they lost Hashiba Maki, and now their best mangaka, Sugiura Shiho, is moving to a different magazine. With the end of Silver Diamond and its side stories, a big question loomed: what will Sugiura Shiho’s next manga be? 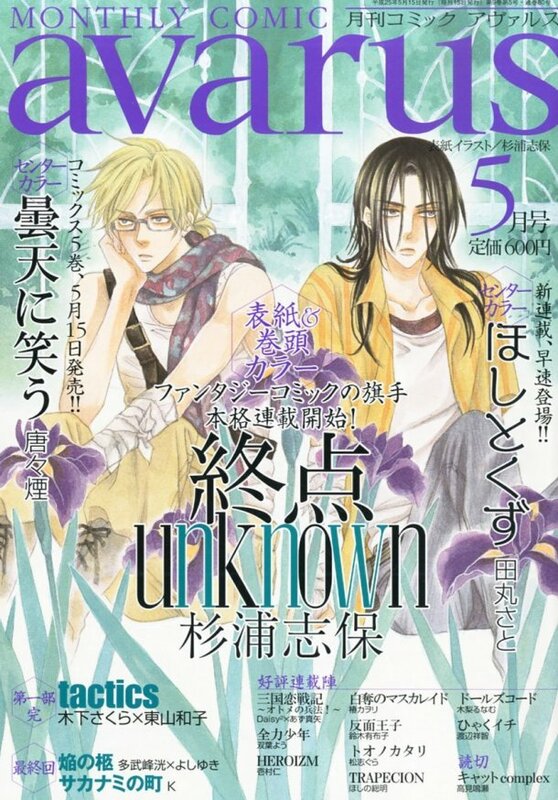 Her newest serialization is called Shuuten Unknown (Last Stop Unknown) and will appear in the May issue of Avarus. It’s a fantasy story about two men belonging to different (perhaps rival?) organizations that hunt treasure. Treasure hunting? Sounds like more adventure, which is what she’s so good at writing. Love the character designs. I’m honestly tempted to buy the magazine and I never, ever do that. Either way, I’m excited to see information on her next manga. With the departure of Sugiura Shiho, I can’t imagine Ichiraci has much to offer anymore. 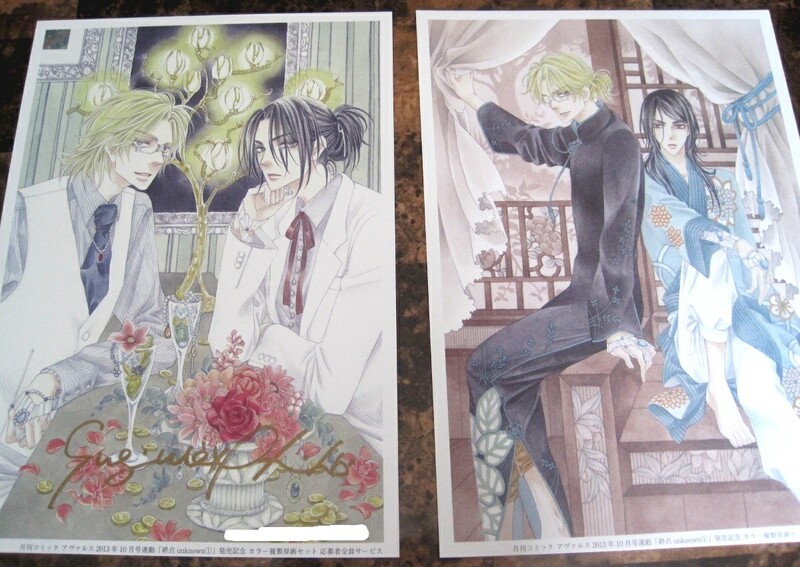 If the ship is sinking, someone needs to rescue Morimoto Shuu and Togawa Mitomo. Tousuisha used to be my favorite publisher and I love the hundreds of manga I own from their earlier days, so it’s been hard watching this obvious decline. However, as long as my favorite mangaka is still working, I’m good. I was nervous waiting for specific news about Sugiura’s next manga, so at least we know she’ll be okay and perhaps receive the same boost in popularity that Abe Miyuki experienced when she switched publishers. The 27th and final volume of Silver Diamond has been released. It’s the end of an era for me. Silver Diamond is one of my favorite manga series and I don’t know how I’ll be able to say goodbye to it. I started reading from the beginning (so ~2004) and have continuously read every manga volume released. In 2007, I lost most interest in all manga and wasn’t reading much at all, but I still kept up with Silver Diamond. This sustained me until the manga addict revival in 2008, which was around the time I signed up for myanimelist. Even though I read lots of manga these days, Silver Diamond time is special time! I need to finish an end of October release order to get my hands on the final volume. Before that, I should probably post the manga I’ve gotten in the past two months.. oops. Whenever I get incredibly busy with work, I just don’t feel like writing. Things will calm sometime in November after my new outreach program is finished. Currently, Sugiura Shiho is publishing some side stories for Silver Diamond, so that might soften the loss. I’ll just have to look forward to her future manga. 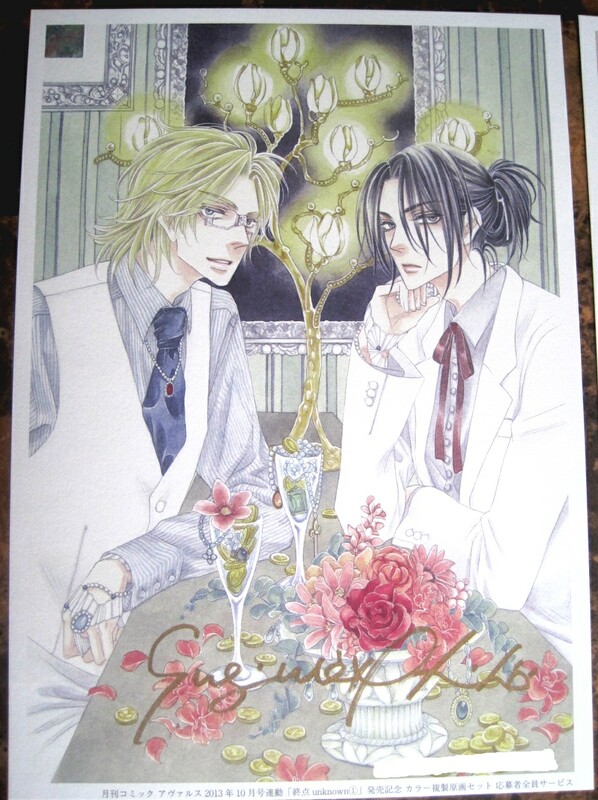 Although I doubt anyone could be as hot as Chigusa. I’ll miss you!